Comparing this breakdown with national percentages tells us that caucasians are over-represented in the visual artist population. Percentage breakdown comparing 2007 to 2012 is stable, well within the margin of error, which tells us that our sampling is likely accurate on this score, although it is important to note that the low numbers involved in the Aboriginal subset should caution us to take the associated data on Aboriginal artists with a large grain of salt, as sampling error increases as one narrows subsets of the data. A second aspect to note is that in our survey, we allowed a response of “other,” “it’s complicated,” and, of course, there was an option of not responding to this question at all. This constituted 6% of all responses, and this category is not tabulated in these results as the reasons for answering thus is not consistent, ergo the group as a whole would not be useful to look at at the level of detail we are reporting. Aboriginals make up 4.6% of the total population of Canada, but only 2.2 percent of visual artists. Visible minorities make up 19% of total population vs 9% of visual artists. Within the visible minority total population, only 31% are Canadian-born, while in the visual arts population, the percentage of Canadian-born visible minorities is 45%. This might suggest that the discrepancy of visible minority representation is due to lower levels of immigrants becoming artists. To consider this, we first look to the total percentage of artists who are Canadian-born, which is 79%, which equals the ratio for the total population. 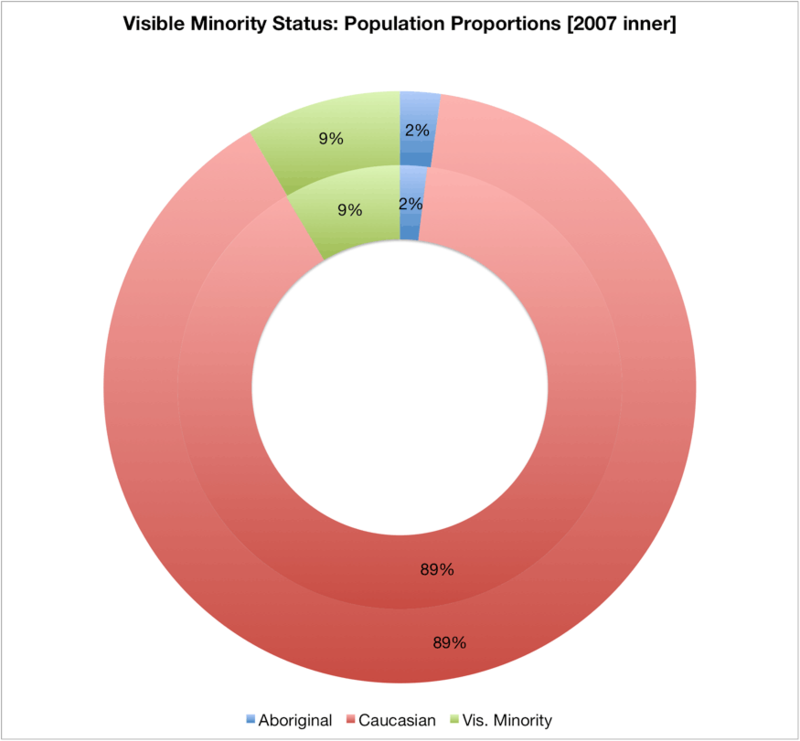 That the total populations are matched in this way, despite the much higher percentage of artists who are visible minorities being immigrants as compared to the national figure, illustrates that the lower representation of visible minorities in the visual artist population is not related to immigration patterns, as the percentage of caucasian artists who are Canadian-born is much higher than in the total national population (83% for visual artists vs 90% for the total population). 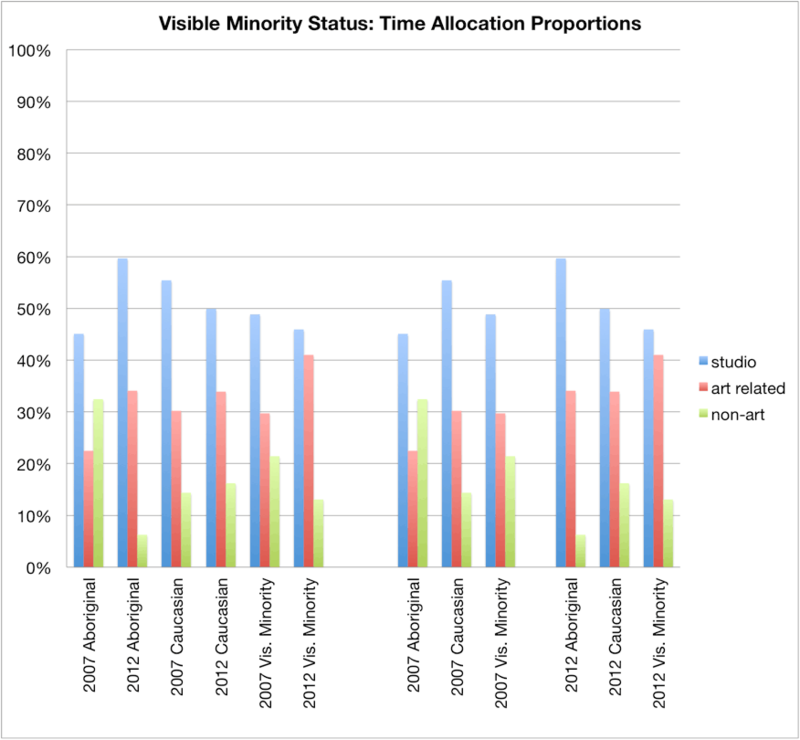 In fact, if we correct the figures (taking only Canadian-born visual artists, and apply the same ratio of immigration rates from the entire population to these figures), the difference between the visual arts population and the population as a whole is only halved (e.g., instead of 9% of artists being visible minorities, this hypothetical model projects 13% of artists being visible minorities, still 5% off from the actual national breakdown). The most obvious thing to note from incomes is that caucasian artists still earn, overall, more than either Aboriginal or visible minority artists in most categories, for both median and average values. Starting from the top, with total income earned from all three sectors (practice, art related employment, non-art related employment), we can see that, on average, income for Aboriginal artists increased dramatically, from $21.4k to $37.1k, average income for caucasian artists increased somewhat, from $25.7k to $30.2k, while for visible minority artists, average total income decreased, from $23.4k to $21.8k. If you’ve been following along in our previous analysis, you will recall that averages, when derived from incomes, can be quite misleading as it does not reflect what middle-range incomes are like (income, particularly in fields such as the visual arts, tend to be skewed to the right, or, in other words, income inequality will inflate an average as a small number of individuals earn significantly more than most (see note 1 below). Taking into account medians, then, we can see something rather different going on than seems to be at first glance. First, while the average earnings of Aboriginal artists has indeed increased significantly, the median earnings have dropped (from $18.6k to $15.3k). This shift, then, points to an increase in income disparity within Aboriginal artists. 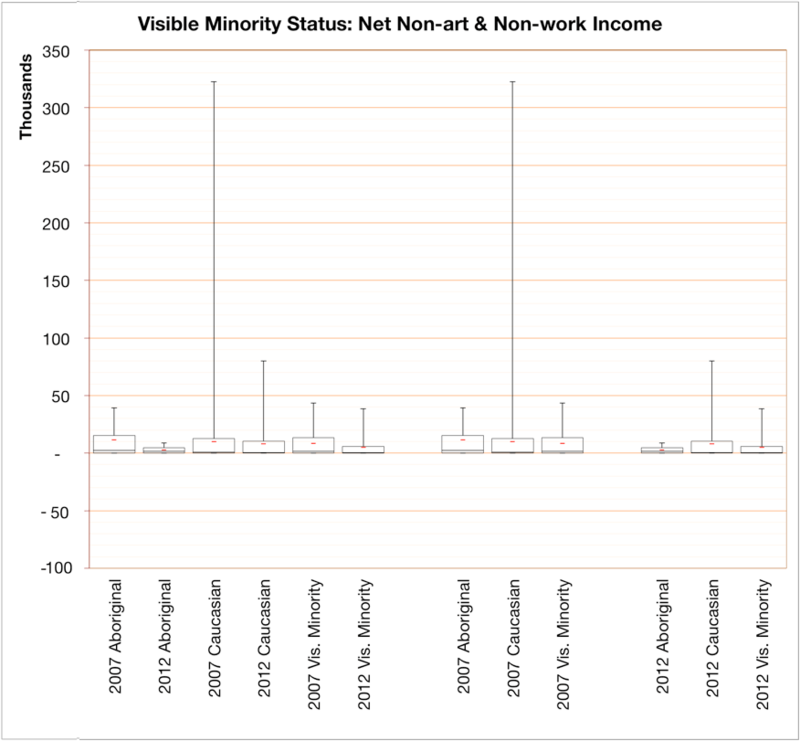 The source of this shift can be seen primarily in a drop in art related and non-art related employment income, and in an increase in practice-based income (primarily from sales). Both educational attainment and gallery representation has also increased, from 16% to 47%. While we have to keep in mind the increased margin of error for this subsector, the increased presence of Aboriginal artists in commercial and public galleries in the past few years has been noticed, and thus it is likely that while these numbers should not be taken at face value, they probably are indicative of a trend. Metro residence of Aboriginal artists has also appeared to have increased, with a huge shift from 22% in 2007 to 57% in 2012. It is impossible to determine if this is representative of an actual shift, or a result of sampling error (which would be amplified by the sampling technique which we used), we would guess (an uneducated guess) that this is probably highly influenced by sampling error. 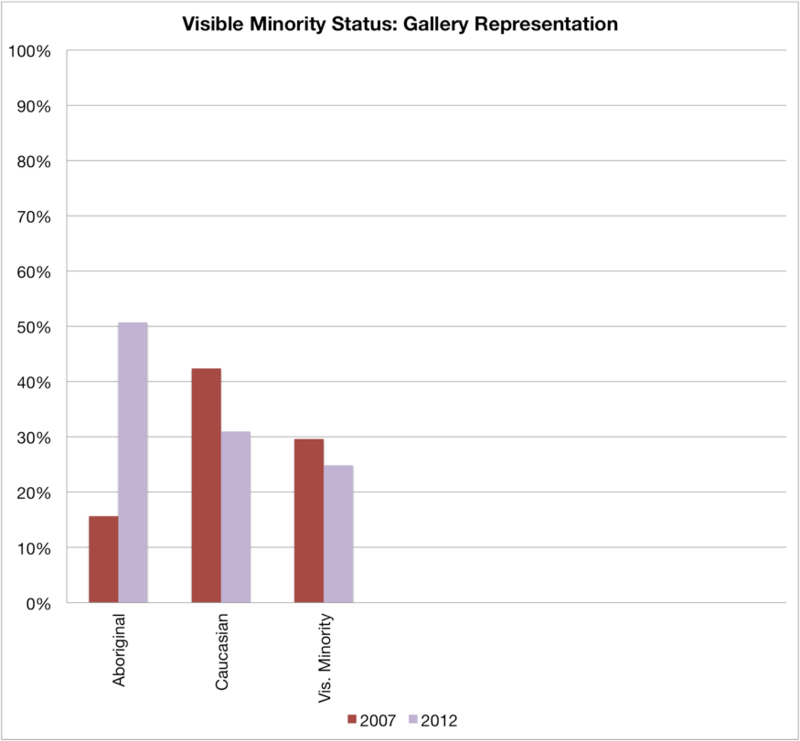 The two areas where decreases have hit caucasian artists more is in gallery representation (a 10% drop) and, subsequently, in gross sales (around 35% drop). 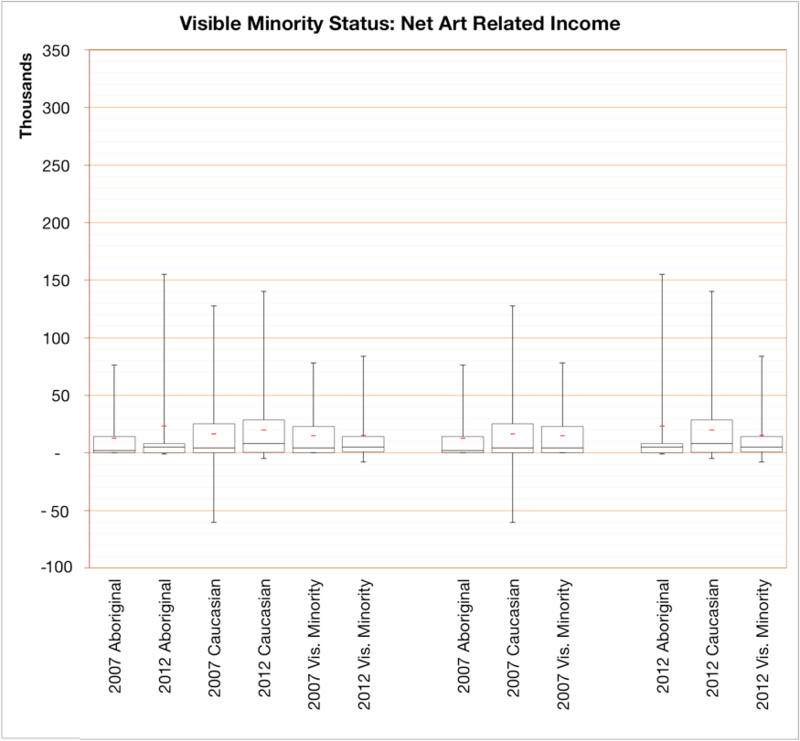 Median total income for caucasian artists increased by about 10%, from $20.2k to $22.4k, and it appears that this increase is attributable to art related income increasing dramatically. As average total income for caucasian artists increased by 18%, we can also surmise that income inequality increased (although the box plot shows that the upper limit decreased, and this inequality is expressed primarily in the third quartile). Visible minority artists, on the other hand, lost significant ground over the two surveys. For total income, both average and median were reduced, average by 7% and median by 28%. Relative to the other two categories, median earnings for visible minority artists match Aboriginal artists, and are significantly lower than caucasian artists. Income disparity within the visible minority subset also increased. Whether these differences, and in particular the backward slide in comparison to the rest of the population, can be explained by the lower average age of visible minority artists is unclear: total incomes increase up to the 35-44 age range, and then drop off but not by as much as they initially increased. 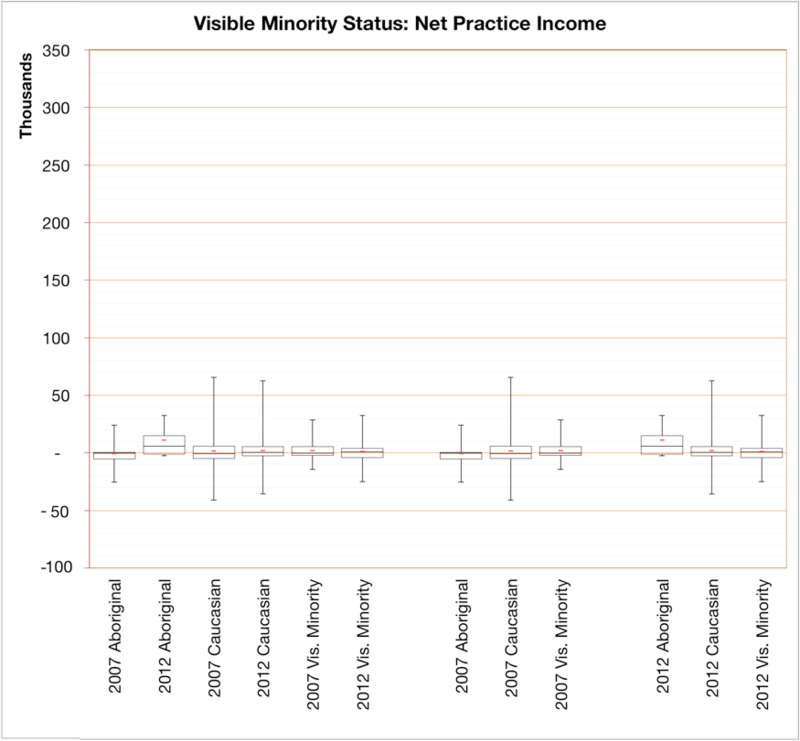 Looking to practice incomes, it is interesting to note that typical (median) net practice income for both Aboriginal artists and, to a lesser extent, visible minority artists are greater than for caucasian artists. 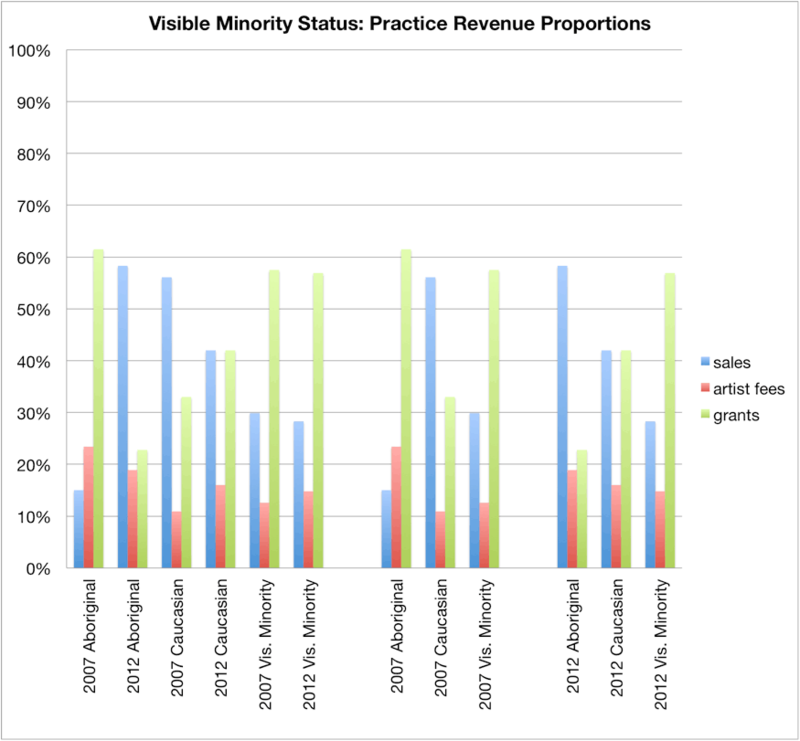 Average net practice income is, as well, highest for Aboriginal artists, with caucasian artists earning slightly more than visible minority artists. The range for caucasian artists is much larger, maxing out much higher than either of the other two categories. NOTE 1: Median versus Average (mean): Imagine there are five artists sitting around a table. In a year, they earn the following: $17k, $21k, $20k, $19k, and $23k. Average earnings are $20k a year. Median earnings (sort the numbers from smallest to largest, and take the middle number) are also $20k. In this case, while there is some variation of incomes earned, the variation is relatively minor and we can say that income disparity is not pronounced. Compare that to a different scenario, though, where the earnings are $11k, $15k, $14k, $13k, and $47k. As with the first example, average earnings are $20k, but median earnings are $14k. In other words, four of the five are earning much less and one is earning much more, relatively speaking. f one were to take merely one description of a set of incomes, median is the most useful, as it tells us what the typical individual subject would be expected to have as an income. The average tells us more about the population taken as a whole, and is also amenable to other calculations that the median cannot be subjected to, such as when we are calculating wage levels. 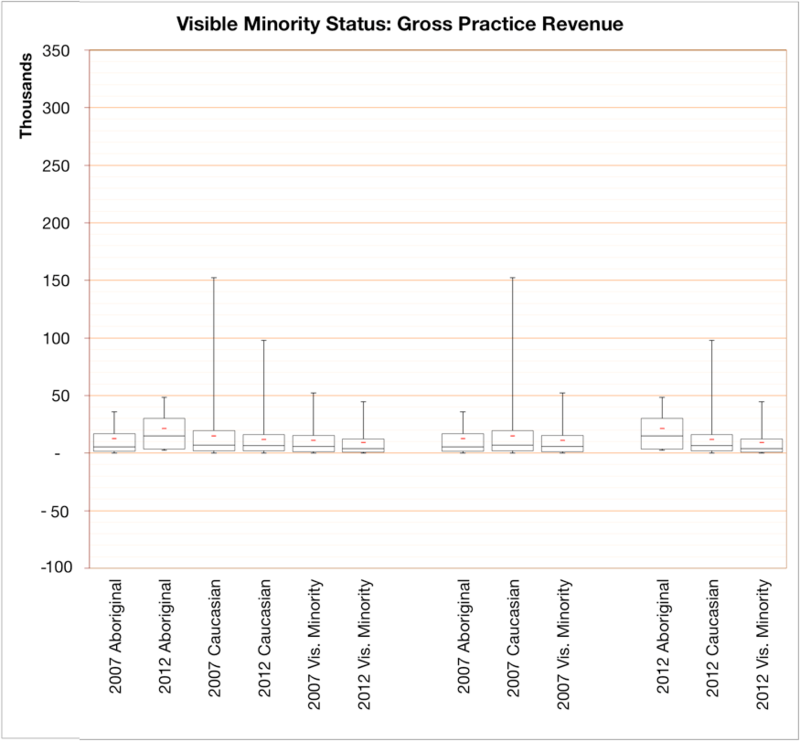 Likewise, when looking at revenue and expenses for studio practices, medians do not add up arithmetically, so to report only medians would look rather strange. If we report both numbers, though, we get even more information. The difference between the average and the median tells how much income disparity is present in the data. When the average is higher than the median, this tells us that this inequality is from a small subset of the population earning significantly more than the majority (which is referred to as being skewed to the right). Alternately, if the average were lower than the median, the income inequality expressed would be skewed to the left, e.g. a small subset of the population earns significantly less than the majority. There are situations where median and mean may be the same between two sets of data, but the distribution of incomes is significantly different. This is where the box-and-whisker plots which we are producing become useful descriptive tools. These are generated by taking the quartiles of a group, i.e., ranking the data and then splitting it into four same-sized groups: the bottom 25%, 25 to 50%, 50 to 75%, and, finally, the top 25%. The middle two groups (the second and third quartiles) are graphed as two stacked blocks, with the line dividing the two boxes being the median. The range of the first quartile (the bottom 25%) is the “whisker” on the bottom of the middle blocks and the fourth quartile the “whisker” on the top. Even though the first and fourth quartiles visually appear less populated, as they are lines not boxes, it is important to remember that they represent the same number of data points. A box plot does not indicate the variability within any one quartile (all the points in a quartile but one may be congregated at the upper or lower end of the internal range). Nonetheless, it does give a more nuanced view of the data than a single number or bar graph, and is easily comparable across data subsets. The small red lines on the box plots is the average for the subset. « AGYU@WorldPride: What are your True Colours?